Pours black with brown hues showing around the lighted edges. Head formation is low, hitting just under a finger in height. It's khaki in color and does not retain well. Aroma flies low and slow, hitting notes of coffee, chocolate, and toasted and earthen malts. The earthiness in this beer is a little surprising. Flavor profile is very similar, hitting notes of coffee, chocolate, and toasted and earthen malts with a dry finish. Coffee mingles with milk notes to tone and smooth it out, which is generally the sign of an over bitter roast. Mouth feel is a touch fizzy at the onset and then smooths out on the palate. It has a medium-thin consistency. Overall, an okay coffee porter. It seems to be a British classic due to being around for so long (first added here at the end of 2004), but lacks the coffee cleanness to be top of its class. Served in a 12oz snifter from a 11.2oz bottle. It pours black with a very nice bubbly head of good retention. The aroma is of coffee, some saltiness and roasty notes. The flavor is very complex, with coffee, chocolate, and burnt bread but also with some acidity and saltiness. I am really amazed at what is surfacing during the ongoing eradication of The Bottle Backlog here at Chez Woody! I remember buying many/most of them, but they all fell victim to my desire to drink away from home for one reason or another. Now, I want to do nothing more than stay at home & play catch-up. I Pop!ped the cap & performed a very gentle pour since the bottle's age was indeterminate. The label read "Best Before: See Shoulder", but it was so faint as to be unreadable. Once sufficiently decanted, I gave it a brisk, in-glass swirl to raise a finger of foamy, light-tan head with modest retention. Color was Dark Brown to Very Dark Brown (SRM = > 27, < 34) with NE-quality clarity & deep amber highlights. Nose smelled like fresh coffee, slightly bitter, but just about like what I drink every morning upon arising. Mmmm. Mouthfeel was kind of thin and watery. The taste, while coffee-like, was kind of weak. I was reminded of coffee with cream or milk, which to me, is not coffee but instead a hot milkshake. It really needed a bump-up in terms of the intensity of its taste to really realize its potential. Finish was semi-dry, but it left me wishing that it had more of a coffee flavor. It strikes me as a work in progress. Poured from a 330mL bottle into a Spiegelau stout glass. L- Clear honey brown color when pouring. Surprisingly clear in the glass with a hazelnut color. Good carbonation with an almost non-existent head. S- Yeasty, dark fruit, espresso, cocoa, fresh herbs, caramel , vanilla. Actually smells quite similar to St. Ambroise Oatmeal Stout. T- Same as smell except it has a pleasant cherry sweetness. F- Too light bodied for my liking. O- A little disappointed with this one. Too light bodied for the style. Very forgettable beer. Brown liquid; purple when held to the light. Nice khaki head which dissipates but doesn't disappear; decent lacing. Roasted oats & coffee in the nose. Not overwhelming but nice. Not as flavorful as I hoped; fairly thin for the style, a touch watery with just a hint of coffee. Disappointing but drinkable. Meantime strikes me as an English rendition of the Boston Beer Company. Mostly saving British styles by reinventing them for the 21st Century palate and winning at the mastery of marketing... albeit Meantime more on the premium end. They also make good beers; having tried at least four. And Coffee Porter is good. Starts more like chocolate and then espresso comes through in the finish. This Porter is one of Meantime's six listings in the "1001 Beers." I doubt all six deserve that selection. (Did I mention that the editors and British publishers of the series aspire to cover topics globally, but sometimes slip into a British bias.) Perhaps so with Meantime Coffee Porter. Dark brown with a ruby tinge, 3 fingers of rich beige head. It leaves a nice lacing. Coffee, molasses, burnt sugar, clean linen, a hint of smoke. Coffee, molasses, unrefined sugar, a little toasted note. Little bitterness. 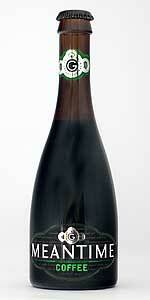 Medium thick body, moderate carbonation, smooth and rounded feel for the style. Found in Bangkok at Villa Market. Drank in Chiang Mai Nov 22nd, 2015. Nice brew, smooth for the style. 330ml, inverted tulip shaped bottle, a near relation to its chocolate cousin in arriving in my local liquor distribution zone of late. This beer pours a clear, dark red-brick amber colour, with three fingers of puffy, loosely foamy, and somewhat silken beige head, which leaves some spooky craggy cloud lace around the glass as things quickly sink out of sight. It smells of dry roast coffee beans, gritty, grainy caramel malt, bittersweet chocolate, a twinge of sour milk, soft black licorice root notes, and a weak spicy, leafy, and weedy hop bitterness. The taste is more grainy, crackery caramel malt, a lessened, but still heady ground artisanal coffee been astringency, muddled cocoa powder, still sort of off-seeming milk solids, some toasted nuttiness, and a plain earthy, weedy hoppiness. The carbonation is adequate in its genial and easy to get past frothiness, the body a sturdy medium weight, and mostly smooth, with a fine airy creaminess milling about, ready to debut once things warm up a tad. It finishes well off-dry, the base caramel and cocoa essences easily parrying the lingering coffee character in the end. Not a bad quaff, the guest coffee promising much up front, playing well with others, and then not overstaying its welcome - my favourite version of the sort. Anyways, a well-made offering, and approachable enough for those who may not be all that keen on mixing the two brewing worlds. Appropriately coffee-looking, with a deep brown body and a latte-like foam. Smells like dark roast coffee, with some nice dark fruit/berry notes in addition to the more typical molasses, dark chocolate, and toffee aromas you'd hope for in a good porter. Really nice, actually. Like a grown-up Frappuccino. Bright, fruity, almost acidic coffee leads the way, with chewy licorice, rich cocoa, cherry cola, and a hint of port trailing behind. Spot on, as is the mouthfeel – rich and smooth but also dry. Excellent stuff. Possible food pairings: creme brulee, dulce de leche, burritos, blue cheese, peanut butter brownies. Very solid. Malts and coffee are the first thing that really come through in this beer. As you drink more the chocolate really comes out. Better than expected may have to revisit this one again. Enjoyed from the bottle in a snifter glass. This nice brew from the UK pours a dark cola brown with a light off white head that dissipates to a thin ring and light lacing. nose of medium roast coffee, light sweet malts, light smoke, and moderately roasted dark malts. Flavors are a light sweet malt mingling with light coffee to the front and sides, light smoky sweet note to back, and a light coffee and roasted malt character on the aftertaste. Mouth feel is solid and standard for English ales with light carbonation and a light dry finish with roasted malt bitterness. A good brew indeed for across the pond. You better like coffee because this is cold fizzy alcoholic coffee.